Harvey states that the collection of quotes is intended for fun and amusement only. "It is said that quotes pass into legend, and get better with every telling. But over the years they can also be bashed around, exaggerated, changed and lose their original meaning." 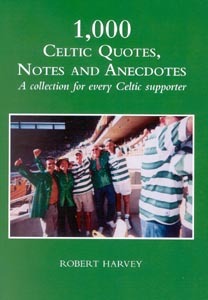 Harvey has dedicated 1,000 Celtic Quotes, Notes and Anecdotes to all Celtic supporters across the World and he is looking for other quotes that he will feature in future editions. Email Robert Harvey with you quotes. "What I noticed when I walked into the dressingroom was the jerseys hanging on the pegs - the colours seemed special. I think it was the sunlight, but the jerseys seemed like sparkling Green and White like I have never seen before. They looked special." "I felt McGrory of Arsenal did not sound right. It wasn't like McGrory of Celtic." Jimmy McGrory, in 1928 - Celtic's greatest ever goal scorer on when he turned down the chance to join Arsenal. They had offered him a blank cheque. "My league debut for Celtic was in October 1969 when we played Raith Rovers. Booby Murdoch was sitting beside me and asked if I was nervous. 'No' I replied. 'Well' he said, 'you are putting your boots on the wrong feet'. I looked down and he was right." "I liked Henrik Larsson's modesty. To him he was always part of the team and never played the superstar bit. He never took the credit for himself." "My proudest moment? Every Friday morning when I look at the board at Celtic Park and see my name on the team sheet for tomorrow's game." "Can you get me a Celtic shirt?" "Wim Jansen is one of only four men in the world worth listening to when they talk about football." "Is it OK if I give him a skelp if he steps out of line?" Jock Stein to Billy MacNeill's mum when he signed for Celtic in 1957. She agreed ! David Tanner (Sky Sports) "Chris, just what is it that has made Celtic Champions this year?" Chris Sutton reply: "We got more points than anyone else". "You cannot afford to rely on history, you have to make it." "Big Jock used to drive down to see our games in Manchester. He would always bring down rolls, square sausage,, macaroon bars and Irn Bru for me and Denis Law." "Nakamura is such a good player he could open a can of beans with his left foot." 1,000 Celtic Quotes, Notes and Anecdotes is an excellent compendium of quotes and anecdotes relating to the great Scottish sporting institution that is Glasgow Celtic. It's probably not meant to be read from cover to cover in one sitting but it is an ideal coffee table book or perhaps for the smallest room in your house. Paul Rowan was born and raised in Glasgow, Scotland and has always loved football. He has been watching Celtic since he was 10 years old. He is lucky enough to watched the Lisbon Lions. One of his earliest memories is the 1965 Scottish Cup final when Celtic beat Dunfermline 3-2 with Billy MacNeill scoring the winner. Robert was at school camp in Meigle, Perthshire that day when his parents came to visit him. He still remembers all the Dads of the children listening to the transistor radios and the great roar when Celtic won! Other early memories include the 1967 Scottish Cup final against Aberdeen at Hampden when he stood in the Celtic end with his dad and 120,000 other people as Celtic won 2-10. His first Old Firm game was in 1970 League Cup Final at Hampden in the rain when Celtic lost 1-0 to Derek Johnstone header. The best Celtic game he has ever seen live was the UEFA Cup final in Seville in 2003. The best individual performance ever seen was Henrik Larsson in that final. Robert still gets excited every week when walking up Springfield Road to Celtic Park.